El Querandí is one of the most traditional places in the city: a place with its own history, capable of offering the most authentic tango show in Buenos Aires, a complete proposal where you can enjoy a wonderful show accessible to everyone. In short, one of the most remarkable features that distinguish our beautiful city is the possibility of bringing together the best in terms of music and gastronomy in its nightlife. In this sense, El Querandí offers you the unique opportunity to enjoy an exquisite dinner accompanied by the best tango show of Buenos Aires night. El Querandí is located in the historic centre of the city. Its decoration respects the Art-deco style of the early twentieth century, giving our visitors the opportunity to enjoy an incomparable atmosphere and an authentic journey to the past. Of course, in addition to rejoicing in a carefully restored atmosphere, our proposal is based on presenting the traditional Argentine dishes and the best tango show in Buenos Aires. In addition to its majestic architecture, our main hall has the capacity to accommodate 190 people with absolute comfort, in a warm, pleasant, comfortable and intimate environment: perfect for all our guests to enjoy our delicious dishes to the fullest. 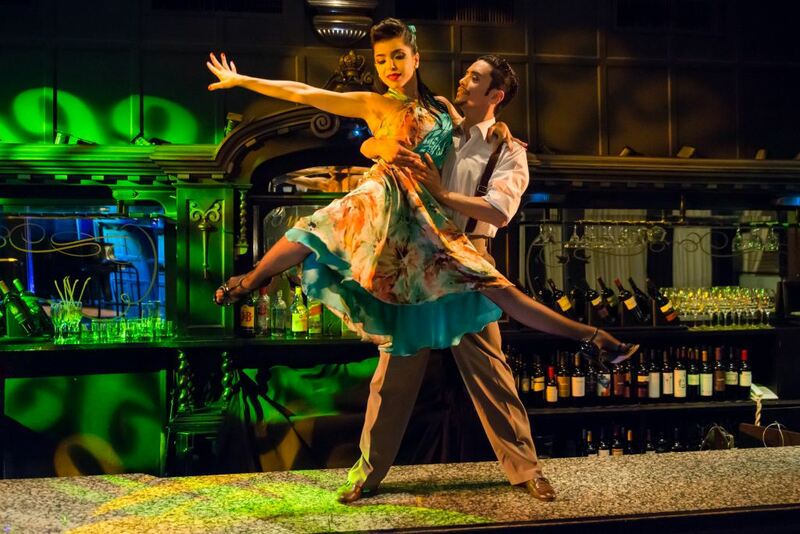 Our show, characteristic of the city of Buenos Aires, consists of a tour of the most representative moments in the history of tango, made up of five paintings from the beginning of Arrabal to Piazzolla’s vertigo. The music, singing and dancing are present every night, performed by the unquestionable hierarchy of our typical quartet, the warm voices of our singers and the passion of our exquisite dancers. Querandí is the best option to live the experience of tango in all its splendour, with its careful ambience, its traditional decoration, its respectful attention to the client and its typical gastronomy, all this in the heart of the historic quarter of the city of Buenos Aires. Tango, passion, romanticism, and history are alive in our house, where the genuine heirs of this tradition invite us to relive, night after night, an unforgettable experience.